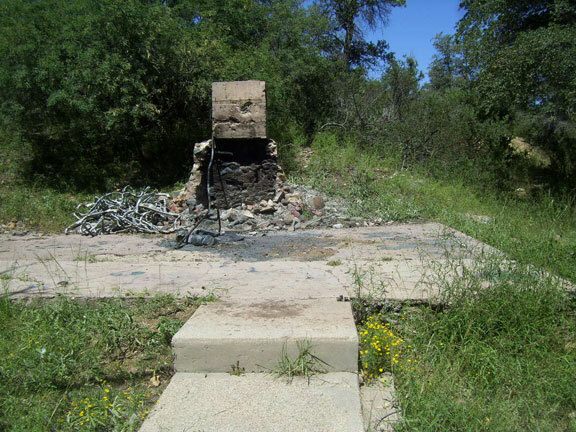 Photo: The Camp Bonito remains of the fireplace at the mess hall, near the old Cody-Dwyer mine south of Oracle in the Catalina Mountains. Photo by Robert Zucker. © BZB 2010. The discovery of precious minerals near Tucson attracted the famous Western entertainer William "Buffalo Bill" Cody to Oracle in the early 1900s to invest in several mines in the Camp Bonito District (also called Campo Bonito). In a January 1909 article titled, "Buffalo Bill Enjoys Life Near Tucson,"
"Buffalo Bill (W. F. Cody) returned from Oracle yesterday afternoon, where he has been inspecting several mining properties with Captain John D. Burgess. He was very much Impressed with the mineral section of the country, and believes Tucson has a great future as a mining center. He leaves this morning for New York to round up capital with which to purchase some of the property which he visited. He said when interviewed, "I am very impressed with the mineral lay of the country, but of course, like all mining properties, it take capital to produce the wealth. No doubt, there is a great future for Arizona, and I believe it is on the eve of a boom. I think all the great wealth of Nevada will drift this way the coming year, and with it Arizona will make a big mining country. It is my candid opinion that you have got the goods." "During the last four days I have walked 150 miles and examined a good many properties in that length of time. The Old Hat district, 'Camp Bonita,' strikes me most favorably. I am going east now to see my partner, and I think I will get a batch of them out here within the next sixty days. Two weeks ago I was in northern Wyoming and it snowed two feet and was 22 degrees below zero while we were packing goods to our mines. It is quite a change to come from there to this warm climate, and it made me perspire to prospect this weather. I don't know which is worse, heat or snow, but I am acquainted with both. I am a born prospector. I don't do it because I have to, but because I like it. I would rather be out her prospecting than live in New York all the time with all the money in the world. A few winters ago I rode a thousand miles through northern Wyoming, Utah and all up and down the Grand Canyon prospecting. I have a suggestion to make to the people of Tucson, and that is that they should have a railroad from here to Mammoth to tap the mining country up there if they want to get that trade. I am a pretty good judge of railroads- where they ought to go. Wait till I come, wonderful report from mines. Mill running on forty follar ore. Tucson Banl buying our consentrates as come from mill, get busy. Waldorf Hotel forst November, telegraph there. High Jinks' will be a winner too. In partnership with his old cronies, John Burgess, scout and prospector, and Colonel L. W. Getchell, mining engineer, Colonel W. F. Cody has started to develop 100 claims in southeastern Arizona (2000 acres) about 40 miles north of Tucson. These claims were taken up and acquired years ago by Captain Burgess, who put In enough work on them to satlisfy him that they contained several fabulously rich veins besides immensely valuable placer deposits. He plugged along and hung on, and one day it occurred to him he had just the sort of thing that would interest his old friend and comrade of pioneer days, Buffalo Bill. Colonel Cody had wime casual experience in mining ventures, few of which had turned out profitably. So at first he turned a frowning front upon Captain Burgess and his overtures. Ultimately, however, he thought better of It, adl after a series of interviews with the veteran scout and prospector he made up his mind to go Into the deal and furnish the necessary capital, provided It met the approval of Colonel Getchell. who has mined and prospected from Mexico, to the uttermost ends of Alaska, across the continent to Nova Scotia and who had his entire confidence. Getchell was the most trusted expert of the Old Comstock bonanza crowd, and it was upon his judgment that Senator John P. Jones, John W. Mackay and associates Invested many millions in the acquisition and development of mines in the mountain country. Colonel Getchell has made and lost many fortunes made them in mines and lost them In a variety of miscellaneous enterprises and speculations. He is now a moderately rich man and has for years lived quietly in New York, with headquarters at the Hoffman House, where he occupies the same room he took sixteen years ago. He had decided never again to engage In active mining, being content with a reasonably large Income from his investments in that industry. The Cody-Getchell-Burges syndicate has turned six claims at Campo Bonito Into a $600,000 corporation under the style and title of the Campo Bonlto Mining and Milling company, and the first development work will be made there. The mines at Campo Bonito contain gold, silver and tungsten and surface workings yield about $30 a ton. The ore runs nearly 3 per cent tungsten, a mineral which has come Into large use In the hardening of steel and in the manufacture of lamps. The supply has thus far been short of the demand, which is constantly Increasing. The plant which is now being installed has a capacity of about 100 tons a day, on which there will be apparently a profit of not less than $2000 a day net, according to expert estimates. The workings thus far have been on surface ledges and at only moderate depths. Whenever shafts have been sunk on the claims the ore has Increased in value with depth, in one part of the estate the ores run to gold copper and silver, in another to lead, silver and gold, and in another section to gold, lead and tungsten. Picked samples on the Bonita claims have carried as high as $600 In values. On a dozen or more testa an average of $70.80 was reached. Making all discounts that seemed right, it was decided that $30 a ton would be a safe base line. Colonel Cody carries in his pocket a nugget of pure gold taken from one of the Campo Bonito claims that is worth about $60, and he shows it with great pride, says a New York exchange. Several of the 100 claims In the group contain dry placer deposits, running from $2 to $5 a yard. This part of Arizona is famed for its dry placers, which have been worked in primitive style by native Mexicans and Indians for hundreds of years. It is no trick at all for Mexicans and Indians to pan out from $2 to $5 a day by shaking the gravel and sand in blankets. Enthusiasts who have gone somewhat into this subject of dry placers say that there is enough gold in the desert sands of Arizona and Sonora to give every man, woman and child in the habitable globe $1000 apiece. Over the next few years, Cody often stayed in Oracle, with his wife, at the Mountain View Inn so he could see how his investments in his mining ventures progressed. Cody would often camp out at Campo Bonito with the miners among his claims for weeks at a time as they dug for various minerals including tungsten, used by Thomas Edison in his light bulb filaments. Cody made several trips over the years and stayed for months at a time in Oracle and Camp Bonito. The Cody-Dyer company had control of 45 claims and had driven dozens of tunnels into the ground. They sold Scheelite to a steel manufacturer in Pittsburgh. High-grade tungsten ore from the mines replaced the carbon filament in electric lighting. A quartz mill was set up in October 1911. According to notes by E. J. Ewing, a relative of Dyer, in 1912, the company spent $70,000 but did not receive much value in return. Dyer turned to Ewing for advice on his investment. Ewing believed the investment was more of a scheme. He wrote how the Bonito mill was in good operating shape, but suspected mismanagement. In his report, Ewing described large outcrops of quartz he saw on the Morning Star claim of the Southern Belle mine group which "rose some 25' or so above the surrounding limestone. But, Ewing also discovered that Cody was deceived in a sale transaction over the Bonito interests, but Cody was hesitant to prosecute. When the value to tungsten increased in the fall of 1915, Ewing said he advised Cody and Dyer to advance some operating funds. Neither were able to make a move. Cody "was bled about white" and Dyer died shortly after a long sickness. Ewing later discovered a hand-size chunk of Wolframite in the area. Cody's impact on Oracle still remains with the Cody Trail and Cody Loop, both near the Campo Bonito properties. TUCSON, Ariz., Nov. 17 Tucson is now one of the greatest shipping points for tungsten, one of the rarest and most valuable metals in the mechanic arts in the world. This is the first announcement of the fact ever made in print. A carload of tungsten ore, taken from the mine of the Cody-Dyer Arizona Mining and Milling company, near Tucson, now lies in the warehouse of the Southern Pacific railroad, sacked ready for shipment. It will be loaded today for shipment to Hamburg, Germany, where it will be acidized and rendered ready for use in commerce and the arts. Colorado is the greatest producing point of tungsten in the world but, if the physical promises of the Cody Dyer Arizona mine and the commercial promises of the company hold out, it is likely that Arizona and Tucson will lead within a year. The fact that Tucson is the buying and shipping point for supplies not only for the tungsten but the gold mines of the Cody-Dyer Arizona company, the mines of both metals laying within a mile, of one another, makes this one of the most important industrial development announcements ever made in connection with the Old Pueblo. What makes the announcement of still more importance is the fact that the company is a bona fide development company headed for big business and not for the stock jobbing arena. As every man in it is already a millionaire in his own right, with an abundance of producing investments, and both the gold and tungsten properties have been developed to a surety and the owners are disposed to push development to the limit, there is little doubt as to that development. The mines are situated 45 miles north of Tucson and six miles from Oracle. The owners expect to develop a small town of their own for the convenience of their miners and mill operatives. There are now two 40-ton mills there, and another 100-ton mill will be put in immediately. The immediate expenditure for machinery, etc., will total nearly $100,000. The roads from the mines to Tucson are good, and the ores are now being teamed to this shipping point. It is the calculation to soon put out five and seven-ton traction engines to do the hauling. Colonel Cody, in his three years' experience in mining in Arizona, has always contended that in the general mineral formation of Arizona the, has always contended that in the general mineral formation of Artizona, the best values lay deepest and in his judgment has been confirmed by development work. Buffalo Bill (William Cody) in front of Acadia cabins with Acadia owners, Mr. and Mrs. Wilbur H. Winters (second and third from left). He purchased mining stock in Campo Bonito near Oracle, from the Arizona Memory Project. Read the original newspaper articles digitized by the Chronicaling America Newspaper Project, a National Endowment for the Humanities project of the Library of Congress. Select a link to open the newspaper page in a new window. Choose from several viewing formats from PDF to JPG. 2. "The Lives and Legends of Buffalo Bill" By Don Russell, p. 434. 6. The Lives and Legends of Buffalo Bill" By Don Russell, 435-436. 9. "The business of being Buffalo Bill: selected letters of William F. Cody, 1879-1917" By Buffalo Bill, Sarah J. Blackstone. Page 94-96. The Maudina Mine, part of the Campo Bonito Group was operated 1908-1912 and 1915-1916. Owned in part, or at times, by the Cody-Dyer Arizona Mining and Milling Co. (1908 thru 1916); and, Campo Bonito Tungsten Mines. Also known as/designated: Williams Tunsten; Cody tunnel; Campo Bonito Tungsten propert. Mineralization is quartz veins in granite with tungsten minerals. http://www.mindat.org/loc-51771.html. Robert Zucker, a Tucson, Arizona native, author, former journalism instructor and newspaper pubisher, is the CEO of Entertainment Magazine network, publisher of AZentertain.com. Zucker has researched and explored the Santa Catalina mountains. William "Flint" Carter is a local miner who has been prospecting the Santa Catalinas and surrounding areas for decades. Carter has held dozens of mining claims and has been in persuit of the lure of the legends. © 2011 AZentertain.com. All rights reserved. Entertainment Magazine network. 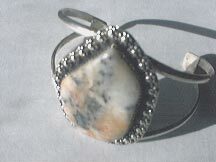 BZB Publishing, Inc.
Cody Stone is mined and designed as jewelry grade gold and silver in quartz from the mountains of the Santa Catalinas. Cody stone specimens and hand made items are on display at the Oracle Inn Steakhouse & Saloon in Oracle, Arizona. Get a tour of the area, see artifacts of the Iron Door Mine and Southwest, and mine for gold with Flint Carter. The only source for Cody Stone. Call Flint at 520-289-4566. Locate the Catalina mountains with your Garmin GPS. Garmin International is the global leader in satellite navigation. Since 1989, Garmin has designed, manufactured, marketed and sold navigation, communication and information devices and applications  most of which are enabled by GPS technology. Outdoor enthusiasts: Garmin has mapped every hill and valley for your next great adventure. See what's new at the Garmin web site.